Ultra warm and comfortable, the EVERFLEX 7/5MM is built with SCUBAPRO's exclusive Pure Design Concept, allowing pre-formed dimensional shapes to move more naturally with your body, delivering unparalleled comfort and flexibility. The new Diamond Span thermal inner liner now has a second lining that increases stretch by 20 percent. 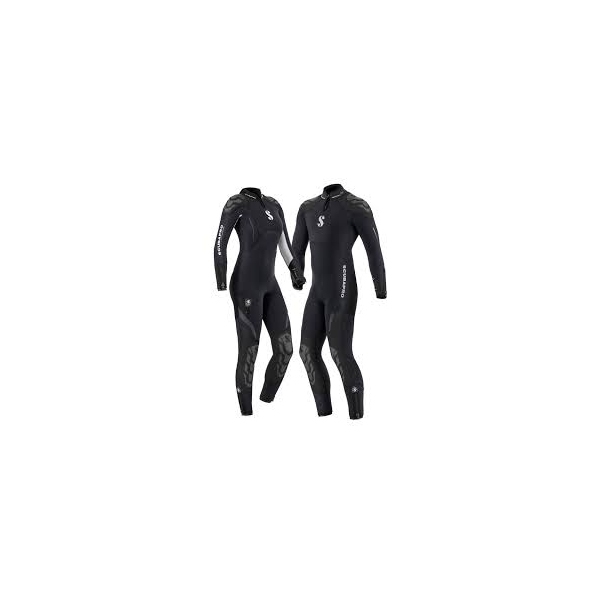 Durable and water-blocking blind-stitch construction, excellent Glideskin seals on ankles, wrists and neck and an easy-slide diagonal rear zipper combine to make the 7/5mm a warm, comfortable and user-friendly dive suit. Technical Information: Made from 100 percent Everflex neoprene, an X-Foam formulation, for durability and better health. Suits are assembled using a solvent-free water-based glue. SCUBAPRO is the first in the industry to offer this environmentally and diver friendly adhesive material. Multi-thickness panels deliver a superior combination of warmth and flexibility. Pure Design Concept uses fewer seams and panels for maximum flexibility. Double blind-stitched outer seams are durable and watertight, and single blind-stitched inner seams are comfortable against bare skin. New nylon thread resists abrasion for longer suit life. Diamond Span inner lining's water-draining material enhances cold-water protection. For 2016, it is combined with a second lining for improved stretch, making donning and doffing that much easier. Diagonal back zipper offers increased long-term durability and ease of use. Glideskin seals at the wrist, ankles and neck minimize water intrusion. 7/5 mm and 5/4mm suits feature double zippered seals at ankle and wrists. 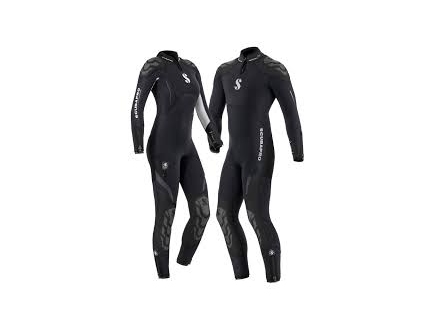 3/2mm suit features single Glideskin seals at the wrists. New neck zipper aids in donning and doffing and enhances comfort between dives. Compression-molded zipper flap/spine pad reduces water entry and increases back protection. Tatex knee and shoulder pads offer protection against abrasion. Seat area is also protected with an abrasion-resistant outside lining to increase durability and extend the life of the suit. Extensive range of new sizes for both men and women means all divers can enjoy the perfect fit and the ultimate in comfort. Available in 16 mens and 17 womens sizes. Click on size chart for more details. Available Sizes: Men: S, ST, MS, M, MT, LS, L, LT, XLS, XL, XLT, 2XLS, 2XL, 3XL, 4XL, 5XL. Women: 2XS, XS, S, ST, MS, M, MT, LS, L, LT, XLS, XL, XLT, 2XLS, 2XL, 3XL, 4XL.